Fairy Wing Fridays are kind of like Casual Fridays . 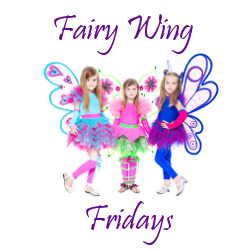 But Fairy Wing Fridays are more magical than jeans and Hawaiian shirts. Fairy Wing Friday starts with fairies. Please post a photo of you or a member of your family in your fairy wings or other magical attire. If you were a fairy, what color would your wings be? Either way, have a magical weekend, friends!